MØ On Being Both Mainstream And Alternative: "It's Hard To Find The Balance"
Alt-pop sensation MØ was in town recently for a killer show in support of her new music releases. We spoke to the unconventional star, where she shared what it’s like returning to Singapore after 20 years, who she counts as “music family”, and when you’ll be able to hear her next album. Expect nothing short of 100% from Danish singer MØ. Whether it’s levitating in her music videos, topping charts across the globe with Major Lazer, or electrifying the stage with her live show, MØ is an undeniable force to be reckoned with. She brought that bundle of energy to her maiden Singapore concert last Sunday, packing the venue’s dance floor with a buzzing crowd that comprised mostly of eager-eyed hipsters and fervent expat fans. While an early minor technical glitch briefly made for some confusion, trust MØ to continuously scale up the attitude as her setlist progressed – and it was clear that her energy bounced off the audience. While the songbird’s catalogue made up mostly of dancey electro-pop numbers, she pranced around with the dynamism of a full-blown punk rocker through hits like ‘Nights With You’ and ‘Drum’ – jumping relentlessly, flicking her hair to every beat, and even attempting a crowd surf towards the end of the night. But it was the epic closer of her chart-topping ‘Lean On’ with Major Lazer that drew the loudest sing-alongs and biggest smiles before MØ wrapped up the 70-minute set with a final bow alongside her band, but not without one last ecstatic “Singapore!! !” exclamation of gratitude from her. And judging by the warm reception that night, we wouldn’t put it past her flourishing success for a return on our shores on a festival stage, or to a larger crowd in the future. Speaking to us at Hotel Jen Tanglin Singapore ahead of her gig, MØ kept a contrasting laidback approach for the interview, where we delved deeper behind her artistry and knack for crafting out bona fide hits. Hi MØ! Is it your first time in Singapore? It is my first time coming here for a gig but I was here as a kid when I was 8 years old actually. The last time I was here, it was 20 years ago and it was a long time ago. But I remember that I hadn’t been in a country that was so hot and humid [until then] and I remember it was clean, beautiful and had exotic plants. I was just [gasps] and there were temples. When I came in last night, the moment I stepped outside the doors and felt the humidity, it reminded me of being here previously. They say that everything changes quickly here, so I guess there’s a lot that’s different since 20 years ago. Was there any food that you wanted to try again, or you’ve yet to try? This morning I had this amazing food that I remembered I had too when I was here as a kid. But I don’t remember what it’s called – it was this bread with some kind of curry. It tastes so good! Congrats on your recent EP When I Was Young. Why did you release it as a surprise? I like the whole thing about doing surprises. But it was also ‘cos I’m working on my second album and it’s almost done now, but it’s been taking so long between my first album to my second that I felt like I had to put out something. I’ve been writing so much music within these years and I kinda needed to put out some songs that go way back, mixed with some new songs and put them in just a little EP. I really wanted to do that. What was it like having so many songs over the course of four years in your back pocket, then choosing which to put on an EP? My second album’s coming out next year, and I think for the EP, it was not that hard to pick [which songs] actually. I had a pile of songs that I knew were going for the second album and all these “maybe”s that I love as well. Then there’s the whole thing about what fits together better. I also have the title for the album, so it’s that whole thing about creating the concepts. Picking the songs for the EP was not super hard because it made sense for this thing, while the others made sense for a full album. There’s a lot of the colour red and imagery of a rose for your When I Was Young EP. What do those signify? The red rose symbolises fertility and maturity. If you see the video for ‘When I Was Young’, I’m was actually really inspired by a painter Edvard Munch from Norway who has these paintings of ‘The Woman in Black, White and Red’. Red obviously is the bloom of life, White is about the pure youth and unspoiled beauty, and Black is about death, the coming of age and getting older. I think the roles are very strong and super symbolic. You’ve done a ton of killer collaborations with everyone from Iggy Azalea to Major Lazer. Which has been the most fun to record? Everyone that I’ve collaborated with, I have huge respect for. And many of them are my friends, but I think it’s Major Lazer. I’ve collaborated with those guys so many times and they’ve really become music family to me. They’re my favourites for life. You clearly have a great relationship with them. Do you guys balance work and play in the studio? A lot of the time when I’m with them, it’s because we’re doing a show or we’re in the studio or something like that. It just feels very family when we hang out. We always work when we’re hanging out, and we have a lot of fun! It’s one of those things where you’ll know it yourself when you hang out with someone a lot, it becomes normal and there’s chemistry. A personal favourite is ‘Final Song’. What would be your ultimate song you’d want to hear at the end of a night? One thing that’s really interesting about yourself is that you’re mainstream, yet still keep an obscure reputation. How do you find the right balance between the two? I think it’s always hard to find the right balance within those two, because it’s two things that’s contradicting each other. But I really have love for both sides of it. I really love the obscurity but I also really love pop music. And it’s so hard because a lot of people think you have to choose one and I totally get that, and maybe it’s true, maybe I should choose! But I am just kind of stuck between it though. What is a good place where you can marry those two things without it seeming weird? But I’m up to search for the right balance. Stay tuned for more of MØ coming soon. In the meantime, check out a special message from her below! Special thanks to Upsurge Productions and Sony Music Singapore. K-fans all over the world will know the pain of having to explain the intricate nuances of K-pop to non K-pop folks. Whether it’s nodding knowingly at their exclamations about how every dude looks unexplainably gorgeous, or refraining from violence when they ask why we like listening to music of a language that we “don’t even understand”, the struggle is real. Which is why Jimmy Kimmel’s conversation with BTS fans – where they schooled him on the bare basics of K-pop totally gave us life. As you probably already know, BTS has been making the rounds on popular TV shows such as The Ellen Show and Jimmy Kimmel Live! And while we’ve had our list of things we anticipated/would love to see happen, the epic exchange between Jimmy Kimmel and BTS fans during a commercial break caught us by surprise. Moving along, Jimmy continued asking about the most popular K-pop groups,”Right now, it’s BTS,” the fans share, “BIGBANG, EXO…” Of course, we hear the audience scream out GOT7 and BAP as well. As the conversation wound down, the fans also ended up teaching Jimmy about RM’s updated name – it took Jimmy a little while to understand the new moniker, but he eventually got it. BTS’ performance on Jimmy Kimmel Live! will be airing on 29 November, Wednesday on ABC, so keep a look out for more BTS goodness as they come! What is the most ridiculous K-pop related question you’ve received from a non-Kpop person? Share your experiences with us in the comment section! It's Official: KARD's Coming To Singapore For Their Asia Tour! 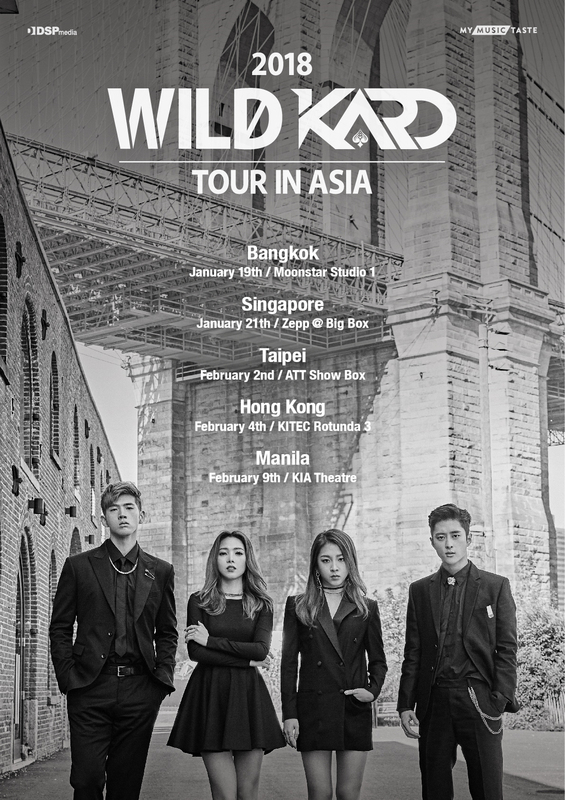 Breakout Korean group, KARD is headed our way come 21 January 2018! Are you ready to catch these wildcards in action? Catching the world’s attention with their insane vocals, popular co-ed group KARD is headed to Singapore as part of their 2018 WILD KARD TOUR IN ASIA. Their second fan-initiated tour, KARD has achieved plenty in their short time since their debut; such as being selected as one of Billboard’s “Top 5 K-pop Artists to Watch in 2017” and having their first world tour in 25 cities including London and New York. Presented by MyMusicTaste, KARD will be kicking off in Bangkok and headed to Singapore afterwards. Fans can expect this powerhouse group to bring older favourites such as their debut effort ‘Oh NaNa’ and newer hits from their latest EP, You & Me! Presale tickets for MyMusicTaste users who requested KARD’s show in Singapore will be available on Apactix on 4 December at 4pm, while general sales start from 7 December at 4pm. For more info, head to www.mymusictaste.com or MyMusicTaste’s social media channels. Will you be catching KARD in action? Sound off in the comment section! Produce 101's JBJ Is Coming To SG For Their First Fan-Meet! Attention all Singaporean fans of Produce 101’s JBJ, your dreams of seeing the boys in the flesh are coming true! The boys of JBJ (which stands for Just Be Joyful) kicked off their first-ever Asia fan-meeting tour recently. 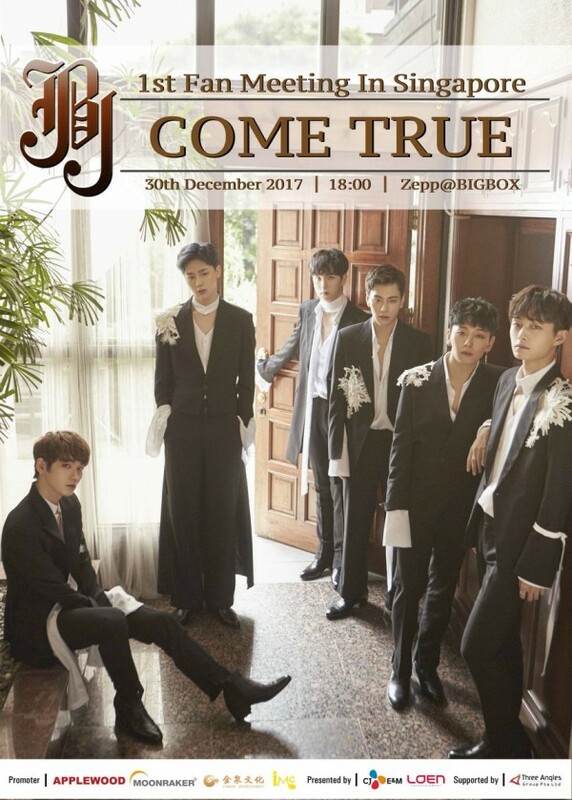 Titled ‘Come True’ the six-member group from Produce 101 Season 2 had their very first tour stop in Tokyo Japan, and they will be headed to Singapore come 30 December! Ticketing details have yet to be released, but stay tuned for more updates! In the meantime, prep for JBJ’s first show here by listening to tunes off their debut EP, Fantasy. Will you be catching JBJ live? Let us know in the comments section!